Just in time for the holidays, a great product from a company few have heard of before. 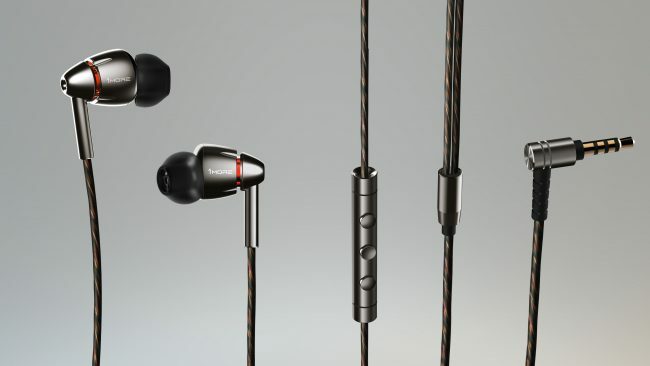 I’m talking about the Audiophiles dream pair of in-ear headphones, the Quad Driver buds from 1More. The Quad-Driver headphones from 1More are the first earbuds that I’ve ever had the pleasure of testing that has four drivers. Why is this important though? A driver is essentially a tiny speaker that is able to convert an electrical signal into sound. When looking at headphones or speakers you’ll see that some have many drivers ranging in size. The bigger the driver, the bigger the sound in theory. When dealing with something as small as an in-ear headphone you simply cannot have a large driver. This is where multiple drivers come into play. Each driver has a special job and delivers a particular sound. 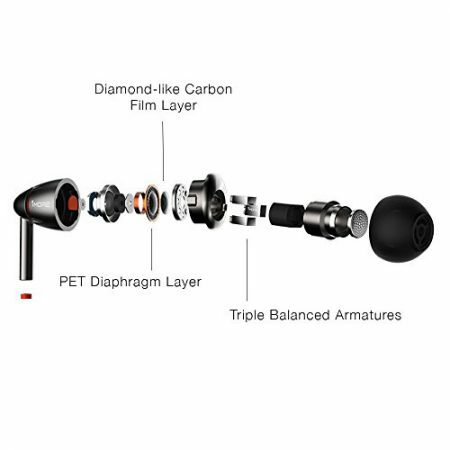 Now, the 1More Quad Driver headphones have a Diamond-like Carbon Dynamic driver that allows for little to no distortion. This driver is in charge of the mid-range frequencies as well as the lows/bass. The next 3 drivers are armatures which are in charge of delivering high to ultra-high frequencies. After using these headphones I’ve discovered that regardless of genre, the music is incredibly clear. There is no noticeable distortion when I crank the volume up either. I enjoyed a variety of music with these because you have too. A lot of today’s headphones are focused on delivering a nice bass sound. This is great if you only listen to Top 40 music (which a lot of people do), but for those of us who listen to Rock, Classic Rock, Electronica, Etc…you need a headphone that will allow for all these different types of sounds to play through clean and crisp. 1More allows for this to happen because of the Quad Drivers. We went over the sound, but that’s not the only factor we can consider when picking a headphone. Comfort and design are equally as important. 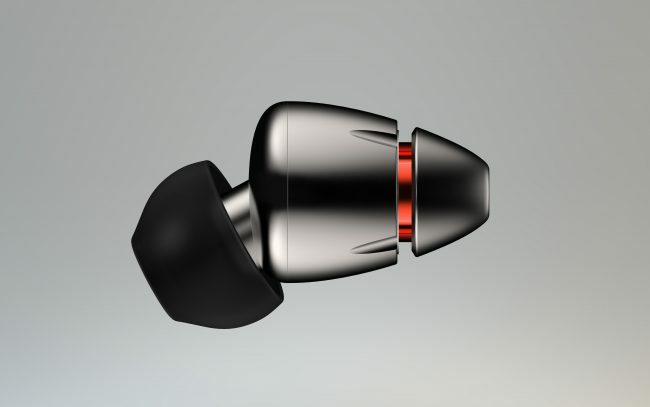 1More recognized this when creating their Quad Driver In-Ear Headphone. A headphone can sound great, but if it’s uncomfortable then you aren’t going to enjoy using them. 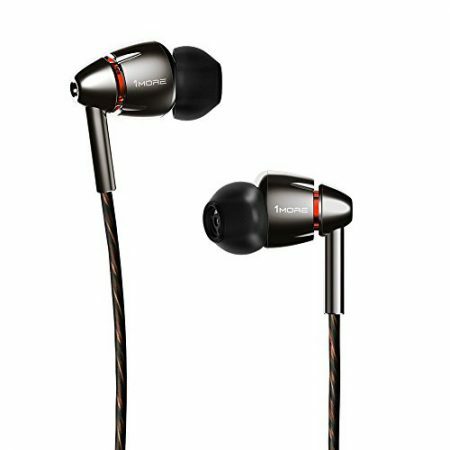 1More created one of the most ergonomic in-ear headphones that I’ve ever had the pleasure of using. The aluminum sound chamber (the headphone itself) is designed with that curve as you can see in the picture above. This is to ensure that the music is being played directly into your ear, as to prevent any noise from leaking out and to keep from distracting the person next to you. Because of this, they are relatively noise isolating, not noise canceling. There is a difference. Every one of us is unique, which means our ears are likely to be different. 1More has included 8 ADDITIONAL tips to ensure the perfect fit for you. That’s 9 tips altogether. Assuming you have two ears, you will be able to enjoy the 1More Quad Driver Headphones comfortably. Another cool feature is that the 1More Quad Driver Headphones have an included in-line mic with control. This isn’t uncommon anymore, but that doesn’t mean it isn’t worth a mention. When walking throughout the city, I like to enjoy my music while on the go. This often means that my phone is stowed away in my pocket. With the ultra-slim jeans I wear, sometimes there’s just no way I would want to take my phone out to answer a short call or simply skip a song. That’s not going to happen. That’s why I assume they included the in-line mic and controls on such a luxurious in-ear headphone. Without missing a beat I can take a phone call with crystal clear reception on both sides. I can hear them, while they can hear me without all of the background noise. While walking and talking, the wind was not an issue with these as it can be with cheaper counterparts. This is my favorite part. Yes, the sound and comfort are the most important part but when you are buying a high-end product you want to feel like you’re getting more. You want to feel like you are Johnny fricken Depp when they arrive and 1More has got you covered. The 1More Quad Driver In-Ear Headphones come delivered in a beautiful, book-like gift box. 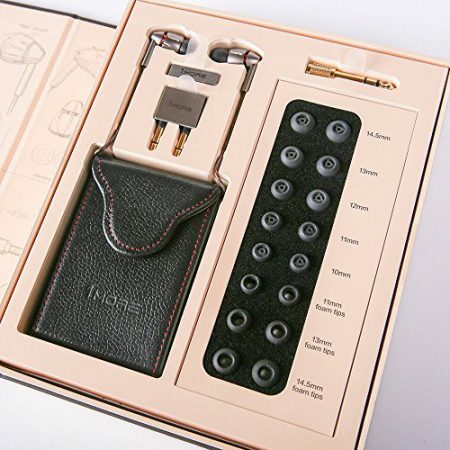 Once opened, you will see a plethora of accessories including a leather carrying case and the 8 additional ear-tips. Leave this package on a coffee table, it’s that beautiful. This is a high-end product, but you don’t have to be a millionaire to own these. You can pick them up directly from 1More for $199 on their Amazon page by clicking here or by visiting them directly by clicking here. Now that it is the season of giving, you should give the 1More Quad Driver In-Ear Headphones to anyone who loves, enjoys and appreciates music. It’ll be a gift they’ll cherish for years to come. I assure you.